Using The Doctrine Of Direct Benefits Estoppel To Enforce An Arbitration Agreement Against A Non-Signatory To A Franchise Agreement. Using The Doctrine Of Direct Benefits Estoppel To Enforce An Arbitration Agreement Against A Non-Signatory To A Franchise Agreement. In Everett v. Paul Davis Restoration, Inc., 2014 U.S. App. LEXIS 21059 (November 3, 2014), the Court of Appeals for the Seventh Circuit was asked to review a district court’s finding that a non-signatory wife was not bound by an arbitration provision in the franchise agreement signed by her husband. Applying the doctrine of direct benefits estoppel to the facts of the case, the Seventh Circuit Court reversed the district court’s decision after finding that the wife had received a direct benefit from the franchise agreement – namely, benefits flowing from the operation of a franchise. This direct benefit was sufficient to bind the wife to the arbitration provision in the franchise agreement. In 2004, Matthew Everett and his newly formed company, EA Green Bay, LLC (“EAGB”), entered into a franchise agreement with Paul Davis Restoration, Inc. (“PDRI”) for the operation of a full service water, fire and mold cleanup and restoration business in northeast Wisconsin. Matthew signed the franchise agreement as the “100% principal owner of EAGB” notwithstanding his wife’s (Renee Everett) 50% ownership in the company. Although the franchise agreement expressly required all principal owners of EAGB to sign the agreement, Renee never did. By not personally signing the franchise agreement, Renee never expressly consented to the terms of the agreement – most notably, the franchise agreement’s post-termination non-competition provision and mandatory arbitration clause. Building Werks’ continued operation was in direct competition with PDRI and its neighboring franchisees. After learning of the Everetts’ continued operation, PDRI initiated an arbitration proceeding against both Renee and Matthew seeking to enjoin the operation of their competing business and for an award of damages for breach of contract. Renee countered with an action in Wisconsin state court seeking a judicial declaration that, as a non-signatory to the franchise agreement, she was not bound by either the arbitration or the non-competition provisions therein. PDRI, a Florida corporation, removed the case to the District Court for the Eastern District of Wisconsin and, thereafter, opposed Renee’s requested relief. The district court – applying the doctrine of direct benefits estoppel – found “abundant evidence” that Renee “directly benefited” from the franchise agreement making her subject to the agreement’s mandatory arbitration requirement. PDRI’s arbitration then went forward. As part of its final award, the arbitration panel enjoined Renee from (1) competing with PDRI or its franchisees in specific geographic territories for a period of two years, (2) transferring her business to a third-party, and (3) using any of PDRI’s trade secrets. Renee was also ordered to provide an accounting of all business conducted by her and pay to PDRI a 25% commission on all such business. Finally, the arbitration panel ordered Renee to pay all costs and expenses of the arbitration, including PDRI’s legal fees. PDRI and Renee then filed competing motions with the district court – PDRI to confirm the arbitration award and Renee to vacate the award. In ruling on the motions, the court reversed its earlier decision now finding that Renee did not receive a direct benefit from the franchise agreement because the benefits she received “flowed through her ownership interest in EAGB and her relationship to Matthew Everett, but not to her directly.” Based on this finding, the district court granted Renee’s motion and vacated the arbitration award. PDRI appealed to the Seventh Circuit. 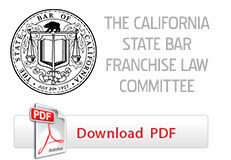 Applying the doctrine to the facts of the case, the Court rejected the district court’s analysis and found that Renee had received a direct benefit from the franchise agreement – “namely owning and operating a PDRI franchise.” The Court also found this benefit to be “precisely the same key benefit Matthew Everett received” under the franchise agreement. The Court reasoned that Renee’s ownership interest in EAGB would not have existed without the franchise agreement. Because of this ownership interest, Renee was a direct beneficiary under the franchise agreement and subject to its arbitration provision. The Court also explained that the district court’s interpretation of the doctrine of direct benefits estoppel was “to narrow,” and, if extended to its logical conclusion, a non-signatory owner in a company could never be a direct beneficiary of a contract so long as another principle in the company signs the agreement. Such legal precedent could lead to inequitable results. California courts have consistently recognized that non-signatory third-party beneficiaries under an agreement containing an arbitration provision may compel arbitration against signatories of the agreement. See Lu v. Dryclean-U.S.A. of California, Inc., 11 Cal. App. 4th 1490, 1494 (Cal. App. 1st Dist. 1992) (non-signatory third-party beneficiaries of franchise agreement allowed to enforce contract terms against franchisee). California jurisprudence supporting the inverse position – i.e. allowing a contracting party to enforce an arbitration provision against a non-contracting party – is less common and unpredictable. Five months later, in McArthur v. McArthur, 224 Cal. App. 4th 651 (Cal. App. 1st Dist. Mar. 11, 2014), the 1st District Court of Appeal applied direct benefits estoppel to estop a trust beneficiary – who attempted to enforce rights under a trust – from avoiding the arbitration provision of that trust. Reaching the same conclusion as that reached by the Seventh Circuit in Everett, the California court explained that a beneficiary may be barred from avoiding an arbitration clause in a trust if the beneficiary has claimed or received a direct benefit from the trust. While the doctrine of direct benefits estoppel has questionable application under California law, it is alive and well in federal courts. See Kairy v. Supershuttle Int’l, 2012 U.S. Dist. LEXIS 134945 (N.D. Cal. Sept. 20, 2012) (California district court – referring to the doctrine of direct benefits estoppel simply as “equitable estoppel” – explained that, “[i]n the arbitration context, non-signatories can be held to arbitration clauses where the non-signatory knowingly exploits the agreement containing the arbitration clause despite having never signed the agreement.”). Legal authority on the expansion of arbitration to non-signatories is a growing development, undoubtedly related to the courts’ favorable treatment of arbitration in general. The doctrine of direct benefits estoppel is another tool used to expand the favorable treatment of arbitration provisions to non-contracting parties related to the transaction.